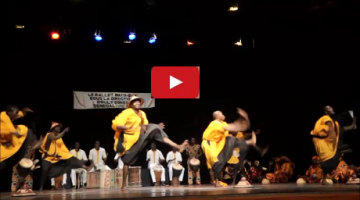 Tjimur Dance Theatre. Photo by Maria Falconer. Tjimur Dance Theatre (Taiwan), presented by the Vancouver International Dance Festival. 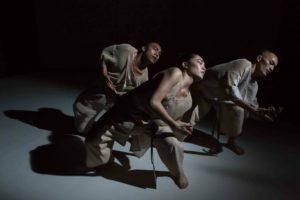 Taiwan’s esteemed indigenous dance-theatre company, Tjimur Dance, performs the Canadian premiere of Varhung – Heart to Heart — a lyrical and vulnerable exploration of the complexities of the human heart. This deeply moving and emotionally honest work, choreographed by Baru Madiljin, gained critical acclaim for its breathtaking movement and heartfelt expression of the traditional culture of Taiwan’s indigenous Paiwan people. Dairakudan (Japan) presented by the Vancouver International Dance Festival. Mar. 8-9, 2019 – 8pm at the Vancouver Playhouse. The highly provocative Japan-based butoh ensemble Dairakudakan, returns with the explosive Canadian premiere of Pseudo human Super human. Choreographer and director Akaji Maro shares his emotionally charged meditation on the dissonance between the fruitless pursuit of technology and the resulting crushing absence of humanity. Showcasing the stunning iron and glass stage installations of dynamic sculptor KUMA/Katsuyuki Shinohara, set to a frenetically energetic score of techno music by Keisuke Doi and Jeff Mills, the butoh masters commence a futuristic odyssey, advancing forward to a world where artificial intelligence threatens to consume our very existence. Ying Yun is the name of Wang’s mother (Ying means Hero & Yun means Cloud), who passed away from ovarian cancer four years ago. 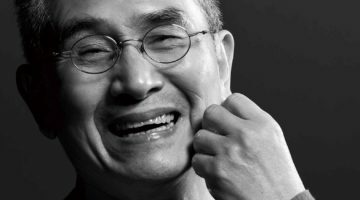 A significant influence on his becoming an artist, Wang dedicates this new creation to her, engaging the dancers in interpreting her story, and in turn expressing their own intersectional experiences. 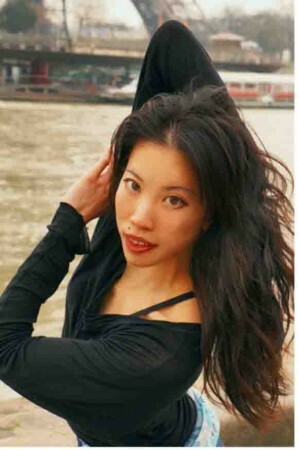 Ying Yun aims to give power to the human body and investigates how dance reflects the current zeitgeist in relation to the larger global issues that women and society are grappling with today. 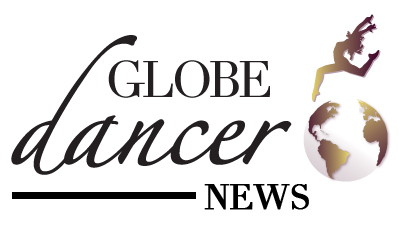 Feb. 6-9, 2019 – 8pm at SFU Goldcorp Centre for the Arts. Rooted in Aboriginal dance, theatre and storytelling, this award-winning work, written and performed by Jacob Boehme, shares his emotionally honest story of gay, Blak and poz identities, and explores the struggle, heartache and enduring spirit of someone living at the intersection of Aboriginal, queer and HIV positive communities. Oct. 26-27, 2018 – 8pm at the Vancouver Playhouse. 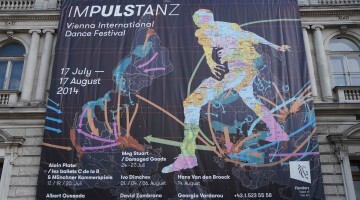 Tickets and details at DanceHouse. Acclaimed choreographic duo Sébastien Ramirez and Honji Wang combine hip hop and contemporary dance with martial arts to explore the meaning of democracy, immigration, manipulation, and the place of individuals in our society today. 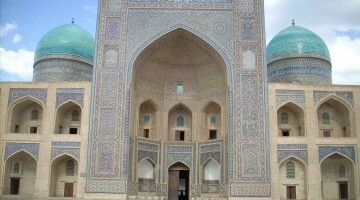 Arno Kamolika in Shyama. Photo by Mohammad Mustafizur Rahaman. Presented by Diwali in BC and the Vancouver Tagore Society. Oct. 27, 2018. Tickets and details at Diwali in BC. A Bharatanatyam interpretation of Tagore’s epic Bengali dance drama Shyama with original choreography by Jai Govinda. This dance theatre piece is a tribute to the first non-European Nobel-laureate poet Rabindranath Tagore and his magically visual poetry and music of love. 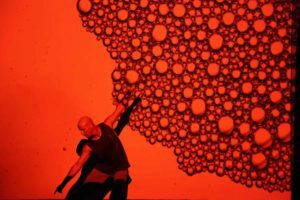 Dance artist Arno Kamolika has been collaborating with musician Shankhanaad Mallick and with director Rohit Chokhani for over two years on this production, and Diwali in B.C. 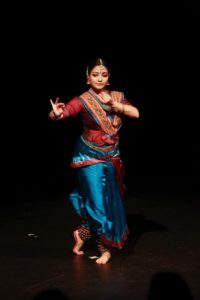 will debut their most current version of this poetic, deep philosophical story that will be performed on stage with other Bharatanatyam dancers: Grihalakshmi Soundarapandian, Jaylakshmi Ravindra , Malavika Santhosh, and Vidya Kotamraju. Illustration by Ola Volo. Photo by KK Law. Oct. 20 – 28, 2018. Tickets and details at www.vancouveropera.ca. Set in the heart of vibrant fin de siècle Paris, the wealthy widow Hanna Glawari schemes to win the heart of dashingly handsome Count Danilo. 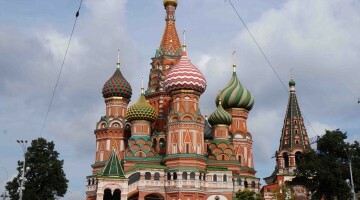 A scandalous caper ensues while suitors conspire to obtain the widow’s fortune. 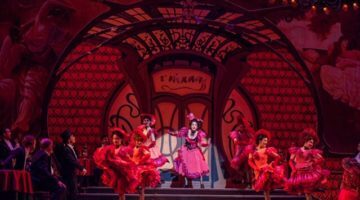 This wonderfully lavish Art Nouveau-inspired production opens Vancouver Opera’s 2018–2019 season and is directed by Canadian Kelly Robinson. Italian-Canadian soprano Lucia Cesaroni will be making her role debut as Hanna Glawari and Count Danilo will be performed by tenor John Cudia. 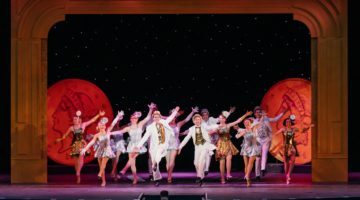 Susan Memmott-Allred’s costumes and Michael Yeargan’s sets evoke the Belle Epoque period, with choreography by Josh Beamish. Tickets at ticketstonight.ca. For more details, visit joeink.ca. encapsulates Laughlin through the eyes of each of his esteemed colleagues. Vanessa Goodman in Never Still. Photo by Ben Didier. Never Still is the newest work from Vancouver’s Vanessa Goodman and is inspired by the inherent conflicts and dichotomies of water. 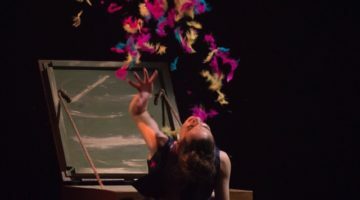 Created in collaboration with its five performers, Never Still is a highly physical piece that explores social, environmental and biological themes. How did the concept for Never Still come about? Never Still started to take form before I even really knew what it would become. In 2013 I created two separate works that were inspired by similar themes. Both works dealt with our relationship to water, either in our environment or our bodies. For me, it was really just a matter of time before I began to really focus on these ideas as a full-length. But it wasn’t until 2015 when I met Scott Morgan (Loscil) through Small Stage, where we first collaborated together, that I could imagine this work growing into what it is today. Each project requires the right collaborators to bring it to life. 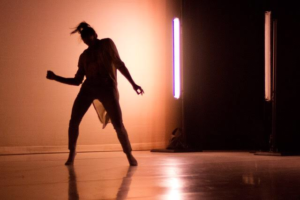 The first in-depth research was during a 2016 creative residency in New Brunswick at Connection Dance Works. Loscil and I also made “Floating Upstream” that same year, a shorter piece that explored these ideas, which allowed us to develop some staging concepts. In 2017 I continued the research through a local choreographic residency at EDAM. I always knew I wanted this to be a group piece, and in the spring of last year, I finally had all the performers together: Shion Skye Carter, Stèphanie Cyr, Bynh Ho, Alexa Mardon and Lexi Vadja. The work would also not be complete without my longtime collaborator, lighting designer James Proudfoot, who is a master of painting space with light. It’s been said that Never Still explores water’s relationship to social, environmental, and biological themes. Can you elaborate? On a very basic level, we are all between 50-70% water, depending on our age, and the earth’s surface is covered by roughly 70% water. There is a beautiful symmetry in that, and the deeper I dug into these themes, the more they revealed. Liquid water is never truly still, which acts as a beautiful metaphor for dance and our own biological systems. It offers a myriad of avenues to explore anatomically and thematically. I feel like it’s very easy in a developed urban setting to take water for granted and overlook its true value, and there’s something intriguing about building a work around something so familiar and ubiquitous. Can you describe the process of developing the show? The show began with research surrounding ideas of precipitation with Loscil, which grew into the solo “Floating Upstream.” From there we continued to collaborate, and with three dance artists and built a piece around biological themes and the human circulatory system. After this phase, I brought all the collaborating dance artists together for a four week creation period to build the movement vocabulary for the piece. 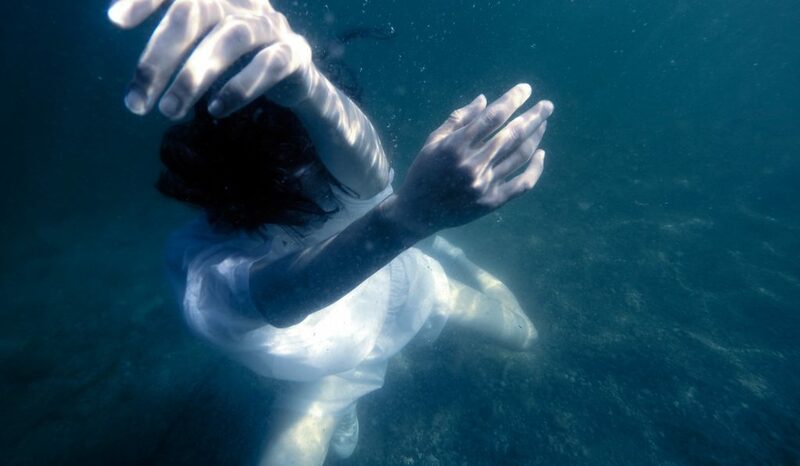 I always knew I wanted to film the dancers underwater to create a feeling of being submerged while in the theatre, and Scott incorporated elements of this into his beautiful visual projects for the piece. Now we are in the final phase of our process where all of the technical and physical aspects of the work are coming together in the theatre. Program 3 – May 10-12, 2018 at Queen Elizabeth Theatre, Vancouver. 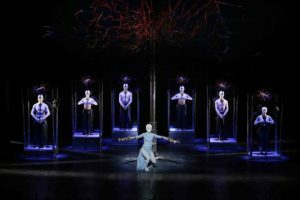 Ballet BC caps off a successful season with their final program, remounting Cayetano Soto’s BEGINNING AFTER, Bill by Sharon Eyal and Gai Behar, and presenting a world premiere of when you left from the company’s artistic director, Emily Molnar. “I love disrupting things,” said Molnar in an interview about her new work. “Sometimes I would disrupt a certain phrase by taking one thing and putting it elsewhere…More than in previous works, I’m playing with pause and repetition,” she describes. 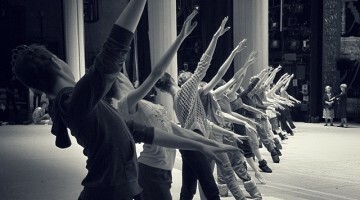 The company just returned from a tour in the UK, including performances at London’s Saldler’s Wells theater, where they received rave reviews. Earlier this year, they performed the beautifully evocative Romeo + Juliet, a full length ballet created for the company by Medhi Walerski. It’s time to see why Vancouver’s contemporary dance scene is getting global attention. Vanessa Goodman’s new work is based on the philosophies of Canadian luminaries Marshall McLuhan and Glenn Gould. 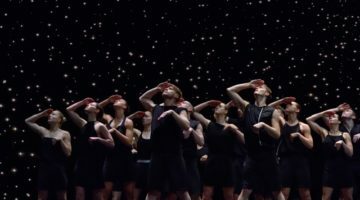 Seven dancers splice together themes of technology and communication in this provocative and vibrant piece, where Goodman is the choreographer and one of the projection artists. Vancouver-based artists collaborating on Wells Hill include composers Loscil (Scott Morgan) and Gabriel Saloman, lighting deqsigner James Proudfoot and projection artists Ben Didier and Milton Lim. Program 1 – Nov. 2-4, 2017 at Queen Elizabeth Theatre, Vancouver. 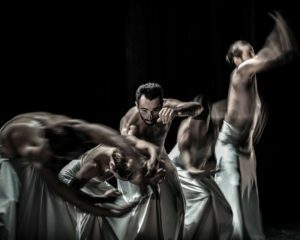 Get ready for full-throttle physicality in Ballet BC’s season opener, with the world premiere of Eight Years of Silence by its Resident Choreographer, Cayetano Soto, and the North American premiere of B.R.I.S.A. by Johan Inger. 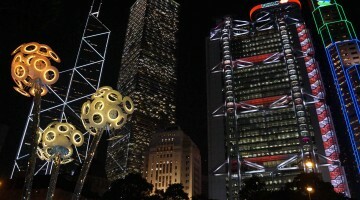 Interviews with Cayetano and Johan reveal more about these works. Acclaimed Finnish choreographer Tero Saarinen explores concepts of masculinity in Morphed. Saarinen performed as a soloist with the Finnish National Ballet for several years before traveling to Asia seeking movement inspiration – in Japan, he studied Butoh and Kabuki. In 1996, he formed the Tero Saarinen Company, which performs his unique aesthetic that combines his classical background with Butoh influences. Sept. 22-Oct. 1, 2017 at Marion Oliver Mccaw Hall, Seattle. PNB dances Balanchine’s works very well. 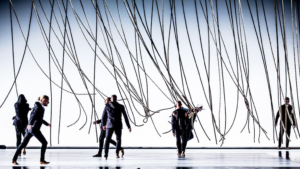 The company has several of Balachine’s works in its repertoire, and its artistic director, Peter Boal, was a principal dancer at New York City Ballet. In 2014, four dancers from the original 1967 production – legends Violette Verdy, Jacques d’Amboise, Edward Villella and Mimi Paul – came to PNB to coach its dancers on the piece and pass on knowledge that they learned from Mr. B himself. Jérôme Kaplan is redesigning the sets and costumes. We’ve seen his work at PNB in Jean-Christophe Maillot’s Cendrillon and Roméo et Juliette. I love how his work has reinterpreted traditional stories. But, Jewels is a story-less ballet that indulges in the glamour and beauty of three schools of classical ballet – French, American and Russian . I am very curious to see how he will renew such old-fashioned glamour. Jewels turns 5o this year – Now that’s reason to celebrate! Falls the Shadow – created by American Ballet Theater (ABT) principal dancer Daniil Simkin. This looks really interesting – Real-time motion sensors transpose dancers’ movements into images that are projected onto the Guggenheim rotunda. Performed by Simkin, ABT soloist Cassandra Trenary (one of my favourite ABT dancers! ), and Hubbard Street dancers Ana Lopez and Brett Conway; choreographed by Alejandro Cerrudo (I’ve been following his work since seeing his charming piece Little Mortal Jump). Roundhouse Community Arts & Recreation Centre, Vancouver. 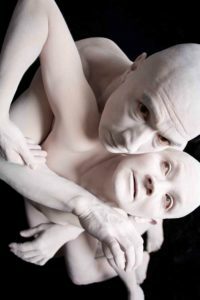 Choreographed by Kokoro Dance Co-Directors & award-winning dance artists Barbara Bourget and Jay Hirabayashi, the company’s latest full-length butoh work, which has been 20 years in the making, is set to the music of acclaimed Polish composer Zbigniew Preisner. Four dancers will strip themselves bare – literally and figuratively – in breathless motion and stillness, embodying the rawness of humanity, while transcending all superficial layers of persona and ego in true butoh style. 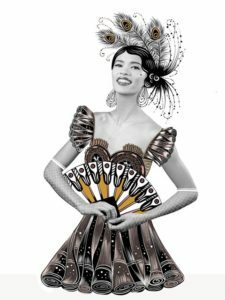 The Vancouver International Flamenco Festival, presented by Flamenco Rosario, returns for its 27th season September 11th – 24th. This year’s headliner is Fuensanta “La Moneta” from Granada, Spain, and is described as an artist who “possesses a deep expressive dramatic quality and an incredible mastering of compás.” She will be accompanied by cantaors, Juan Ángel Tirado and Sergio Gómez “El Colarao”; and guitarist, Luis Mariano. 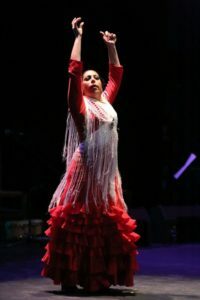 Other performers in the festival include Calle Verde (Vancouver) & Christina Tremblay (Quebec) in an exciting mixed bill, Fin de Fiesta (Toronto) and Vancouver’s own Flamenco Rosario performing Nuevo, New, Nouveau – a set of new choreographies by Karen Lugo and Rosario Ancer, in which they deconstruct the art form and challenge the way we perceive flamenco.